In this Q&A, Brian gives us a preview of what to expect for his Integrated Marketing Week keynote, as well as insights into his writing/publishing process and where the future of marketing is headed. Very few names carry global cache across a multitude of segments in digital and their overall digital transformation of business. Our own CEO Ashley Friedlein and his latest work with the Modern Marketing Manifesto has worked tirelessly over the last decade to fit this mould. 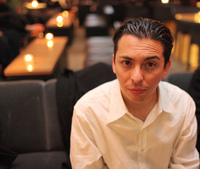 Another pioneer, who recognized the significance of social and multi-channel convergence from the earliest stages is Brian Solis, Principal at Altimeter Group. In the below Q&A, Brian and I chat about what to expect around his presentation, how data analytics and good design impacted the writing and delivery of his latest book: What’s The Future of Business, and the latest trends in convergence and multichannel marketing. What will you be delivering to us at Integrated Marketing Week? More about the moment of truth from the new book? Some brand case studies? I think all of the above. The thing with Integrated Marketing Week is that it’s neat to look at what that means. I am going to bring in an approach that shows that in an era of connected consumer, or “generation c” — convergence takes on a whole different meaning. It’s not just about having presences on all the channels, it’s about connecting it up. I may know my book is doing well, but have we truly connected and converged everything? In the end businesses are still structured around a traditional funnel. So I want to show how this integration and convergence could look based on experiences throughout the entire lifecycle. What does “big data” mean for you when it comes to marketing purpose? I am a big fan of multiple data points and multiple data sets. To me big data is the latest term for a reality that exists out there and it’s finally earning the attention it deserves, not just with data analysts or business intelligence professionals, but with the broader organization as a whole. From the funnel analogy, you have a lot of information that can pour into the funnel. The question is how does it distil, and where does it go during the process? This is a big part of my talk because the four moments are both inputs and outputs, and what we are learned is that there is a gap between the experiences we want people to have and the ones they are having and sharing as a result. Big data is really starting to play a role now in marketing, services and sales, and product development. It’s exciting because it can truly inform what true integration can look like. The importance of it lies at the intersection of data science, and digital anthropology. I often ask clients the question “when is the last time you mapped your customers journey?” and rarely are we doing enough in this distributed digital economy with mobile, social…etc. we need to factor a human algorithm, or the ability to ask a different set of questions so that you can parse the data differently and draw better insights. This will separate the businesses that succeed from the ones that fail in the future. You have companies like Intel and Nokia which employ anthropologists and study human behaviour, but these employees don’t typically get the ear of the right stakeholders and the product development cycle. I live at the intersection of data science and human science and it informs my books, my blog posts, and I love that it is something real that we can point to. What else will you spill early from the talk? Well this may sound esoteric, but believe me it will make sense in the scope of everything. Another concept I’ll bring up that ties in with this digital anthropology we are talking about is the concept of the human API. You have things like the Fuelband right? The smartphone as an extension of us, and the concept that the body is the ingredient required in order to make these things work. I find that fascinating. Imagine the upcoming world of connected devices where these things talk to each other and you have health service providers getting involved. It’s the people screaming loud and clear that they are the center of the universe, and having technology advancing it at the pace that it is, that is going to force marketing to rethink their approach. To be not just transparent, because that’s a buzzword that goes around, but to be human. Sorry to break you from that train of thought, but let me hit you with another IMW13 themed question. In today’s multi-platform, multi-device world, is the old model of web search broken? I think that the way that Google sells ads is still very relevant, and will continue to be relevant for the foreseeable future. This day and age does introduce a new element however. One of the four moments in the book is Google’s zero moment of truth, which reflects two different types of behaviors. The problem is today’s businesses are only aware of one. Customers go to Google, we watch TV, we look at billboards, we call call centers when we have problems, we look at websites when we need to make decisions. Connected customers are much more efficient, giving way to new types of platforms and new ways to take information and act upon it. Take Google as the example. A connected customer does a search for some keywords which you might have optimized for…getting them back to a feedback loop or landing page, but, once they are there the information presented is stuff they would rather do without. An app experience or delivery of call-to-actions through much shorter text and UI designed to pinch and zoom is a better bet, and when you start thinking around that, you realize that a certain amount of people already aren’t going to Google first. They are going to go to YouTube maybe, and type in the same keyword there because a video can be much more efficient at delivery. So now you have all kinds of information that can come back that might not necessarily have anything to do with the company or brand because they were not optimizing for that moment. So the last moment of truth, the ultimate moment, is what really is the crux of The Future of Business. This is the idea that when a customer is your customer, they have an experience with you…whether it’s pre/post/during or all of the above when it comes to the transaction, they are going to constantly share that experience that they have because social and mobile platforms have become this cathartic release. That information and ultimate moment then becomes the next person’s zero moment of truth. We are no longer optimizing for keywords only, we are optimizing for the shared experiences that people are looking for. So where are we seeing this play out beyond Twitter and Facebook’s interest graph? Well, certainly we are seeing this play out in all the traditional ways that companies have been celebrating for several years now in social…that they are listening and engaging. Google+ has started to encourage companies to create information and communities on Google+. But the bigger part of your question, is this idea that people are complaining, and because they are having lousy experiences…and companies are reacting to them because they don’t want those lousy experiences to remain and influence others. So what happens is they get caught up in a game of acting and reacting, where I think there is a bigger opportunity there to find that experience you want people to have using the same technologies and using an integrated approach. What sort of cool new technologies or apps are you using personally these days? The book The Future of Business is driven by me geeking out on UX. Three of the apps that I am excited about are Mailbox, Sunrise (a calendar app), and Waze the traffic app because they are taking advantage of the platform and using the opportunities that mobile and social present to you so that you can have a different kind of optimized experience as a consumer. On June 10-13th in New York, Brian and Ashley will both be preseting at Integrated Marketing Week, the premier, global event for cross-channel marketers brought to you by Econsultancy and the Direct Marketing Association. Register for tickets before May 31st, and save 10%. Tablo wants to be Wordpress for eBooks. Think it has what it takes? Most of us in PR and content marketing are looking for the right tools to augment an ever increasing demand for content generation and that can also help create lasting value for referral traffic on different web platforms. I personally forsee a lot of SaaS startups and cloud collaboration popping up soon to address this market, and we’ve profiled startups like Flockler, and 87seconds in the past, which are examples fitting this mould. A new entrant, Tablo, addresses the eBook market specifically. Whether you are an author, or a web marketer, I suggest paying close attention to founder Ash Davies responses below! Brush up on the themes that will be explored at Integrated Marketing Week (June 11-13) in New York with these free video expert series Google+ Hangouts. Are you a CMO hiring developers to take full control of your brand’s online presence? The next Hangout (Wednesday, May 15) will focus on channel integration. 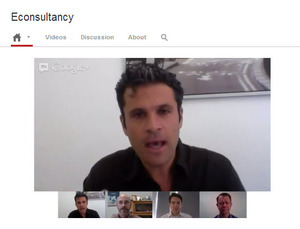 Last week we wrapped the second of our Integrated Marketing Week (#IMW13) video expert series via a Google+ Hangout. The hangout featured Tom Cunniff from ANA Digital Marketing Committee, Jim Sterne of eMetrics Marketing Optimization Summit, and Jon Baron of Tagman. The guys had a lively debate curated by our VP of research in the States, Stefan Tornquist, with audience interaction and questions via Twitter and YouTube.